He continues by exploring the relationship between the two, one that has led to some of the most enduring visual creations over the centuries. 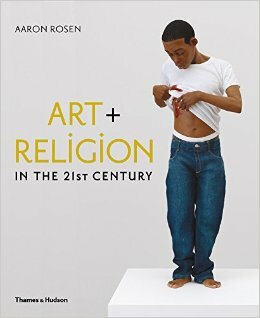 The layout of the book allows you to take in individual examples of contemporary art that draw from religious, or anti-religious, inspiration while perusing Rosen’s astute commentary on the forces that are involved in (and benefit from) the creation of such artworks. Rosen’s view is pervasive. He includes, in his survey, not only art based on the credos or narratives of the Abrahamic religions but also much older creations hailing to a time now roughly consigned to a polytheistic and mythological B.C. The book throws constant reminders at the reader of an archetypal sameness that characterises concepts of deific power across time and regions. Rosen aims at finding unexpected connections between visual practices inspired by different religions. His is an approach reminiscent of American mythologist Joseph Campbell’s, one that strives to strike down categorical, pedantic barriers between belief systems so that everything can be observed with clarity and associations made seamlessly. He prefers art to retain a certain ‘indeterminacy’ so that more can be extracted from it. He also wryly calls out artists who, in order to sidestep any religious baggage that their work may be toting, settle with the term ‘spiritual’ for themselves. ‘I am particularly reluctant to take spirituality as a self-evident category,’ Rosen states in his introduction to the book. ‘Disguised within this apparently neutral term is usually a conflicted assertion about the ways in which someone does and does not see themselves as religious. And these tensions, and the ways they surface in works of art, are much more interesting.’ This is an interesting and valid conclusion to arrive at now when religion, and dissent over it, is catapulting into motion so many events on a global scale. Religion’s influence on art needs to be looked in the eye and acknowledged, probed, and understood rather than skimmed over sheepishly with blanket terms. Through five sections boasting a fine selection of contemporary art, Rosen attempts to do just that. In the first section, titled ‘people of the image?’, he draws a parallel between God and the artist as creators. ‘To depict creation is, to some extent, to re-enact it,’ he offers. Through the works of Raqib Shaw, Grayson Perry, Marco Brambilla, and Marc Quinn, among others, he investigates what it means to create. He also examines various representations of Christ in contemporary art and how artists continue to appropriate the iconography surrounding the Crucifixion to address themes and issues from the modern world. The second section, ‘wonder’, compares religious and artistic experiences of the sublime. Rosen begins by summarising philosophical inquiries into the notion of sublimity from the eighteenth and nineteenth centuries, quoting from Burke, Kant, and Ruskin, before discussing a range of compelling works by contemporary artists (such as Richard Serra, Hiroshi Sugimoto, Olafur Eliasson, and Yayoi Kusama) that evoke a primeval sense of wonder one associates with miracles and re-awakenings in religious accounts. ‘Indeed, when it comes to representing concepts like eternity or infinity, or conjuring states of terror or ecstasy, sometimes works of art with no apparent religious symbolism can be the most effective,’ he posits. The reader enters a discourse on cultural identity in the third section, ‘cultural identities’, illustrating the significance of art from religiously and/or ethnically marginalised quarters. Rosen touches upon practices that are in some way impacted by post-colonial theory and diaspora. ‘No one inscribes their identity on a blank slate, least of all artists,’ he writes. ‘From the start, a host of preconceptions, stereotypes, and outright prejudices ascribe value – both positive and negative – to every facet and mode of representation.’ The artists featured in this section include Shahzia Sikander, Siona Benjamin, Gordon Bennett, Kehinde Wiley, and Imran Qureshi. Perhaps the most scintillating is the last section, ‘indwelling’, which brings the debate back home, back to the most immediate and personal of sites – the body. The flesh is steeped in sin in most religious narratives and carnal desire has been frowned upon in scriptures. But as the rich and remarkable history of art proves, the body can also be, in Rosen’s words, ‘a conduit for faith’. It is through bodily experience that the stages of love and ecstasy leading to an encounter with the divine are transpired and traversed. This concept of ‘indwelling’ is then expanded to include sacred spaces, and both museums and churches are looked at in terms of the sanctity of experience that they allow. Angelica Mesiti, Shirin Neshat, Spencer Tunick, and Rashid Rana are some of the artists studied. In an age when the world plays helpless witness to a grave, new exodus and artists try, with scattered and sporadic attempts, to awaken us to the plight caused to millions by religious differences and political interests disguised as each other, Art and Religion in the 21st Century is a compilation of critical importance. It stresses art’s power to transcend these differences, and to serve as a mouthpiece for truths no one wants to hear but everyone needs to. I am genuinely pleased to read this webpage posts which includes lots of useful facts, thanks for providing these kinds of statistics.